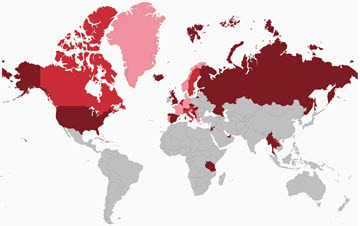 We don’t typically play favorites when it comes to UNESCO World Heritage Sites; they’re all import and culturally significant. But to be completely honest, sometimes they’re also a bit boring and museum-like. And if you’re a regular reader here, you know that standing behind a rope just to have a look-see typically isn’t our thing. We feel connections when we can interact with a place, which is why we loved the Pont du Gard in Southern France. In 1AD ancient Nîmes was a pretty happening place. The bustling and prestigious city of 50,000 inhabitants needed a lot of water for its thermal baths, swimming pools and fountains and running water for its houses. But Nemausus (ancient Nîmes) wasn’t located in the most convenient area for channeling water to the city – low plains lay to the south and east making it impossible for water to flow to the city and engineers found the hills to the west too daunting to be a viable water supply route since they would have had to tunnel through them for some eight kilometers. So when in Rome, er, the Roman Empire, you do as the Romans do. 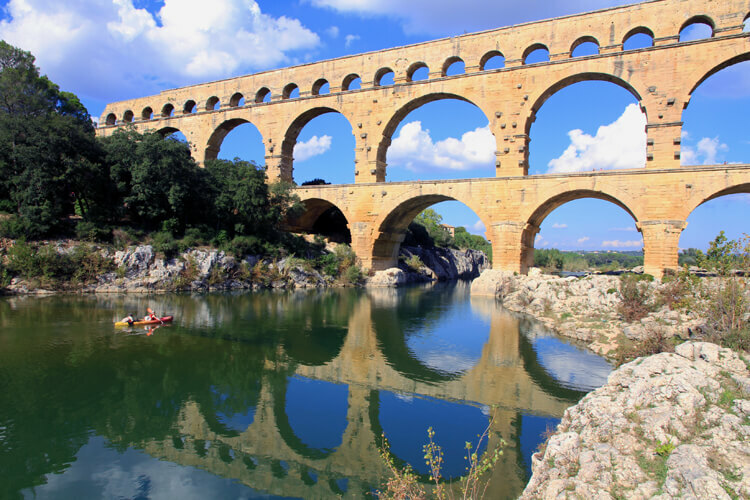 The 49 meter high Pont du Gard was built to channel water from the natural springs near Uzès to the Nîmes Castellum. 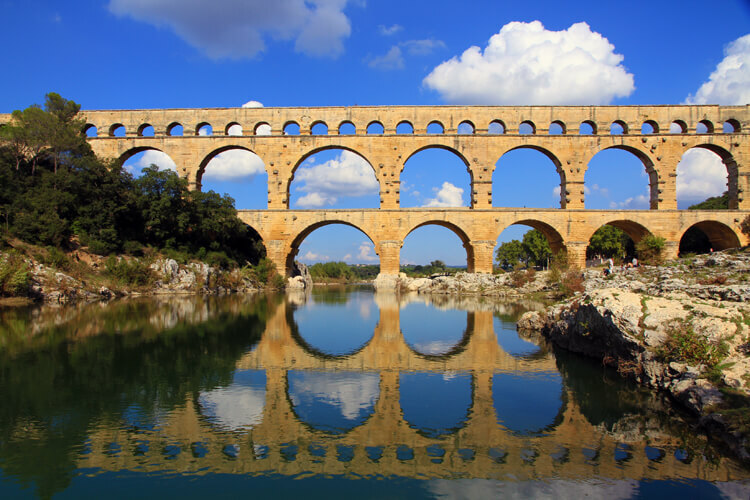 The aqueduct, the highest Roman aqueduct in the world, supplied Nemausus with around 200,000 cubic meters (about 44,000,000 gallons) of water a day. Sounds like an incredible engineering marvel, doesn’t it? So imagine paddling down the Gardon River, surrounded by the bluish cliffs on either side. Suddenly this imposing stone aqueduct comes in to view, the three levels of arches standing high above the river in all their glory. You stare up in awe as the kayak gently glides through the arches. This part of Southern France sees some 330 days of sunshine each year and you’ll definitely want to cool off by taking a dip in the Gardon River. 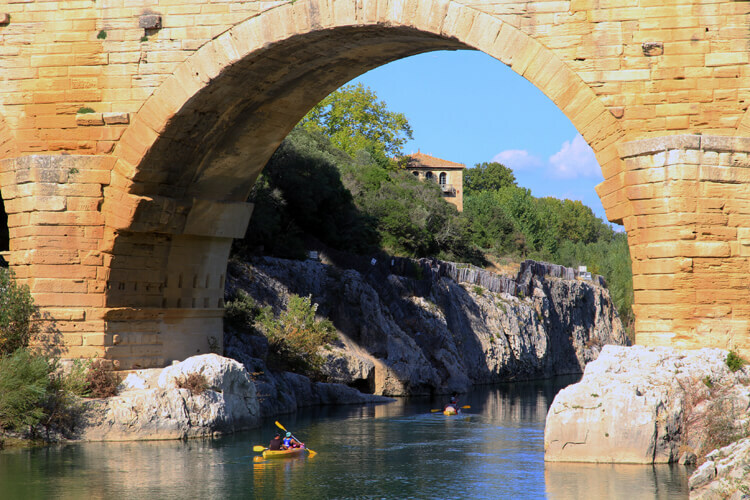 Swim in the shadows of the Pont du Gard’s arches and even enjoy a picnic on the banks of the river. This spot is popular even for the locals to come and enjoy basking in the beauty of the 2000 year old Pont du Gard. Plan to spend some time wandering the entire Pont du Gard site. You can walk across the entire bridge, taking in the magnificent views of both sides of the Gardon River. The right bank is home to beaches where you can swim and the left bank pays homage to the farmers that once used this land. 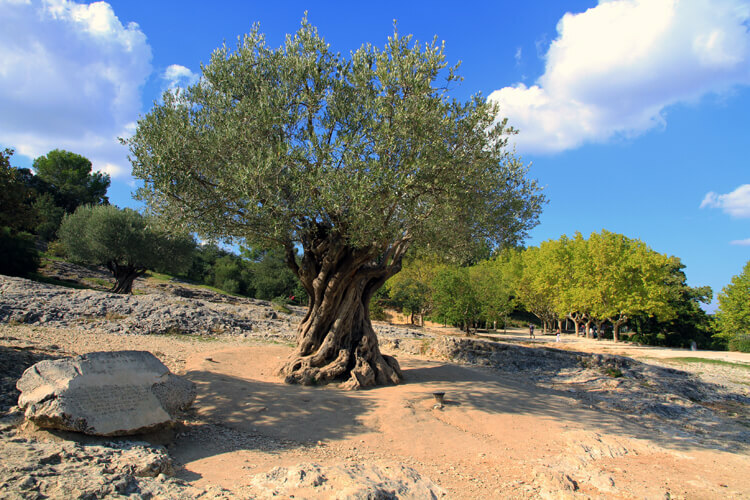 There is an olive tree that was planted in 908, making it over 1100 years old. There is also a museum that walks through the construction, how the Roman aqueduct worked and life in the Gallo-Roman town. Several food options are available too, including snack bars and an on-site restaurant situated with a beautiful view of the Pont du Gard and both a la carte and fixed menu options. Pont du Gard is open year round from 9am. Check the website for closing hours as they vary by season. Admission is €18 per car (up to a family of 5) and includes parking. Visitors entering by foot, bicycle or kayak are €7 per person. 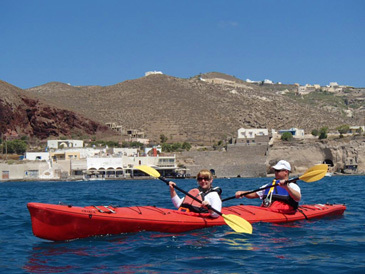 Kayaking is available with Canoe Callias from various points with routes varying from 8 to 31 kilometers in length. Rates vary by length of the trip and range from €22 – €35 per person. 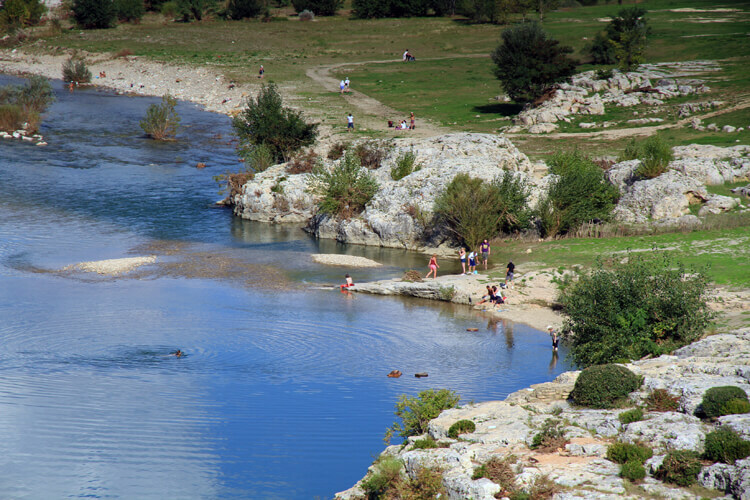 Pont du Gard is located 27 kilometers from Nimes and 21 kilometers from Avignon and is accessible via car from the A9 motorway, via train with a bus connection from Nimes (Line B21) or Avignon (Line A15). What an amazing experience, my husband and I would LOVE doing this! Absolutely gorgeous! Really love those old olive trees, too. Great pics, thanks for sharing! So beautiful! And it is cool you got to kayak through this amazing scenery – like you said, so much better than just looking at it! Places like Rome are still beautiful, but you stand behind ropes and gates. Certainly things need to be preserved and not everyone is respectful as the two American girls that recently carved their initials in to the Colosseum proved, but it’s so much better when you can truly interact with a place. What a beautiful location and engineering triumph. I love when something man-made becomes part of the landscape like this. Also, that tree picture is truly striking. Thanks for sharing this. Thanks Kenin! This whole area of Southern France is just absolutely stunning and well worth a visit. Wow! That looks like quite an awesome experience! Would love to do that one day! Can’t believe that scenery. Can only imagine how it looked from your vantage point! Wow! That looks amazing! I would absolutely love to kayak under these arches!! What an awesome experience!! I bet it was a bit breathtaking. And that tree is pretty amazing, as well! Omigoodness … that olive tree looks like it’s straight out of a movie set! What a gorgeous day to be outdoors. I always think of historic towns and amazing food when it comes to Italy … looks like I”ll have to venture outdoors next time! gorgeous photos, and seriously, that olive tree? swoon. 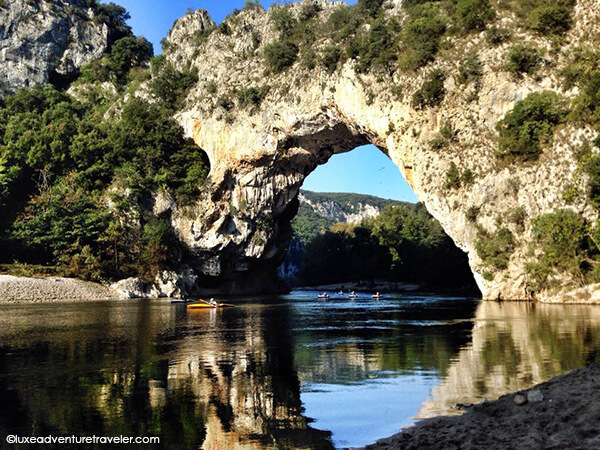 We propose kayak tours at the Pont du Gard and we are river guide. We can even do night trips waiting for the Pont du Gard get illuminated !